The Asphalt Green campus, located between York Avenue and FDR Drive north of 90th Street, provides a center for community activities focused on health and fitness. All the buildings on the campus as well as the land itself are owned by the City of New York and managed by Asphalt Green, Inc. pursuant to an agreement with the Parks Department. Asphalt Green’s Murphy Center has been a significant presence in the New York City urban fabric since 1944, when it began its life as the Municipal Asphalt Plant. Today, the Murphy Center continues to serve a great community need by providing sports and community facilities, and educational programs targeted to toddlers, kids and teens. In January 1976, the Murphy Center was designated a New York City landmark, possessing, “…a special character, special historical and aesthetic interest and value as part of the development, heritage and cultural characteristics of New York City.” Unfortunately, since that designation, time has taken its toll upon the landmark building. Though the exterior shell was repaired in 1998, the interior was in an advanced state of deterioration. Plaster was crumbling off the walls exposing lathe and concrete, water dripped through broken windows, pipes were exposed in dark hallways, and finishes were dingy, harsh and institutional. Heating and ventilation were poor. There was no air-conditioning. In its previous condition, the Murphy Center could barely accommodate Asphalt Green’s traditional programming, let alone the organization’s expanding service mission. This project significantly renovated the interior of Murphy Center and replaced exterior windows with new, insulated versions of those from 1944. Old space was reconfigured and new spaces and floor area were added, increasing program area. 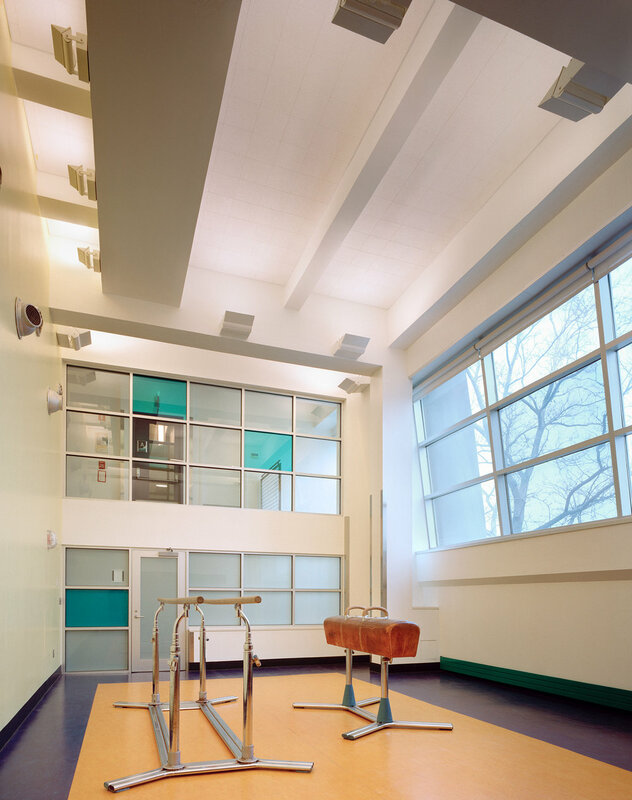 By converting the 3rd floor hallway into a mezzanine on either end, the new design uses natural light to clarify circulation and improve orientation within the building. 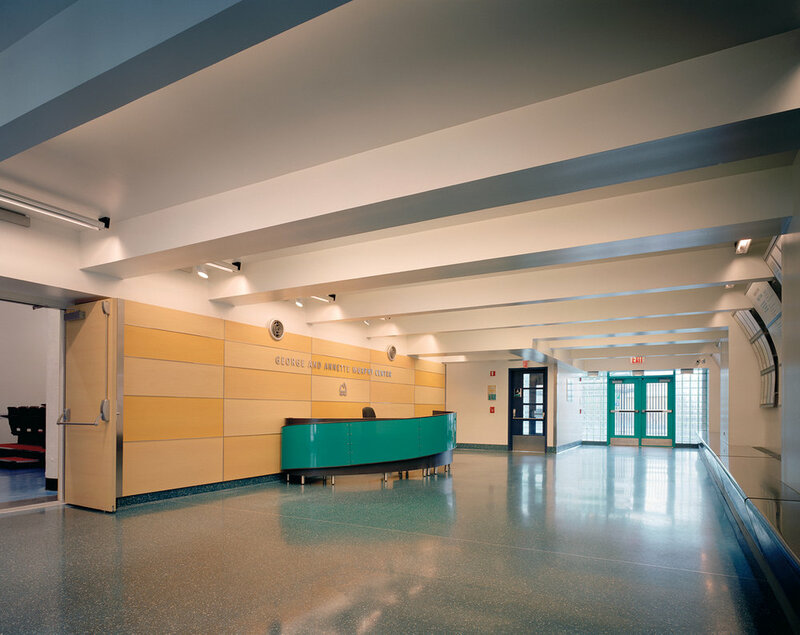 Color and lighting is used to identify stairwells and program areas. New lighting, mechanical, electrical, and plumbing systems are supplied throughout. Non-complying areas were brought up to the standards of the Americans with Disabilities Act and accessible bathrooms were added on every floor. Deteriorated finishes were replaced and upgraded for compatibility with its younger users. The Murphy Center’s vibrant new feel, full of color and light, renders this neighborhood landmark more enjoyable to the community.